What happens if you don’t have a working art file. Comments Off on What happens if you don’t have a working art file. Before Christmas, we had a request come in for a family crest flag. 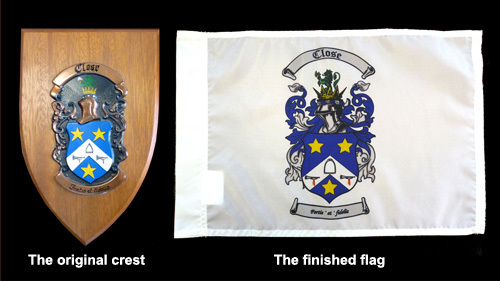 The only problem was that the reference for the crest was a physical three-dimensional plaque! Using that as a guide, we put together the art file using heraldic elements and then hand-drew the rest as needed. Art services are just another part of our dedication to customer satisfaction!